The fifth annual Masada Opera Festival, held at the foot of Mount Masada—one of Israel’s most popular tourist attractions—featured stunning performances of Giuseppe Verdi’s La Traviata opera for an audience of thousands over the course of six days. 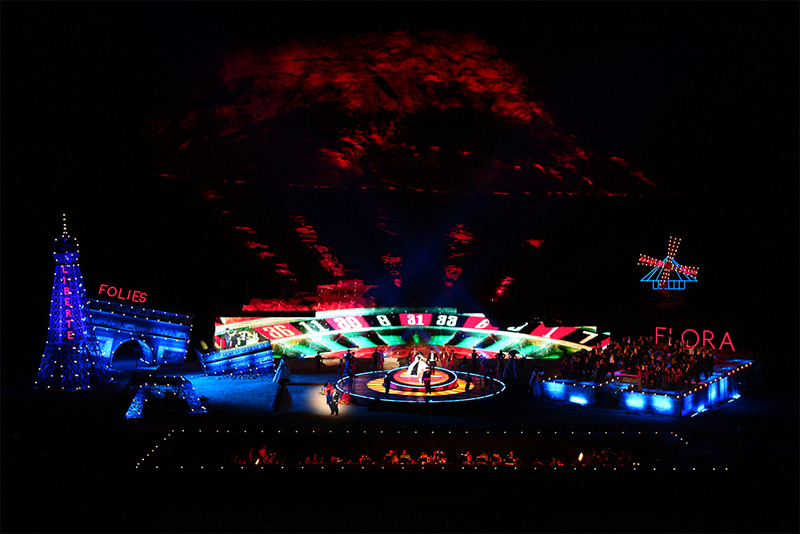 With Mount Masada serving as a stage backdrop and the sets incorporating the desert elements of the area, Lighting Director Bogumil Palewicz along with Michal Znaniecki, Stage Director, and Luigi Scoglio, Set Designer, deployed Martin Professional fixtures to provide stage and effects lighting. The outdoor stage was created to depict the city of Paris, France rising from desert sand. Working with the stage designer and set designer to ensure the audience’s view was not obstructed, Palewicz created a design that positioned the lighting equipment in the sand and on towers placed away from the main stage. Palewicz used Martin’s MAC Aura LED Wash lights to create a bulb effect for the Paris stage and used Martin’s MAC Quantum Wash fixture for white light washes. In addition to lighting the stage, Palewicz also used Martin fixtures to light Mount Masada as a backdrop for the production’s set designs and integrate the mountain background seamlessly with a video wall on stage. In order to effectively extend the stage with the mountain, he utilized Martin’s MAC III AirFX fixtures to light a section of the mountain 1,200 meters wide by 500 meters tall. The production company was Stage Design Israel.